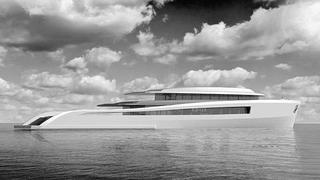 The Pastrovich Studio has unleashed its latest superyacht concept with 55 metre X-Easy. Headed by Italian designer Stefano Pastrovich, with offices based in Monaco, the studio is known for its futuristic designs, such as the Wally Power range of motor yachts. More recently, Pastrovich Studio released designs for its boundary-pushing [90 and 77 metre futuristic superyacht concepts](Pastrovich Studio's new 90 and 77 metre futuristic superyacht concepts). The result is X-Easy, which has similar lines to the futuristic 90 metre X-Kid Stuff, but is a less extreme concept that might be more attractive to a wider audience of owners. All of Pastrovich’s concepts bear the X branding, an aeronautic inspiration as Stefano Pastrovich is a pilot, and the “Easy” moniker comes from the yacht’s brief that it offers easy livability, easy maintenance with minimal crew and is easy to build. The X-Easy is presented as more achievable to build than Pastrovich's X-Kid Stuff concept, as it can be constructed with existing techniques, materials and power packages – diesel-electric hybrid power is proposed by the studio. The two-level design has a “beach house” feel and each room has large windows to ensure a connection with the sea and outdoors, fulfilling the yacht’s purpose as, “a platform for letting us, the spectator, view the world,” says Pastrovich. The design enables crew to be kept to a minimum of nine crew members; materials used in the construction and the interior are easy to maintain and clean. Interior styling, also by Pastrovich, will utilise linen, cotton, teak, bamboo and stones. An emphasis is on holistic design, with the interior and exterior conceived to create the sense of a seamless space. Loose furniture is suggested so spaces can be adaptable for any occasion. Highlights of the layout include a wellness area with spa and gym, while a bow terrace hosts a table for al fresco dining in privacy. The beach club owns the stern, with sliding glass doors opening to the interior lounge area, while tenders and toys – Pastrovich suggests there is “loads” of rooms for toys – will be launched from a main hangar on the side of the hull. Pastrovich’s last concept was for a much larger X-Ballet explorer yacht series, which stretches from 50 to 92 metres.